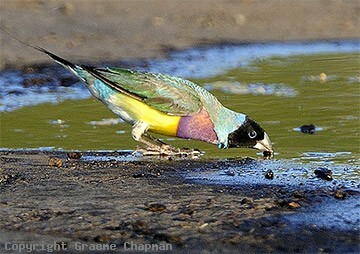 Gouldian Finches are undoubtedly the most beautiful of all the finches of Australia. This may well have been part of their undoing. Their popularity as an aviary bird led to wholesale trapping for the aviary trade until it was made illegal in 1981. 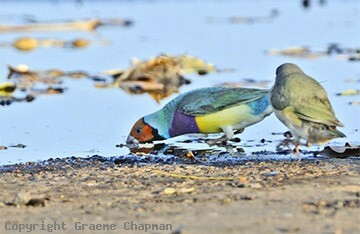 Gouldian Finches are now classed as endangered. Formerly widespread across northern Australia, there was a rapid decline in populations in the mid-1970s. The main reason for this decline has been attributed to grazing by cattle and the associated changes in fire regimes. 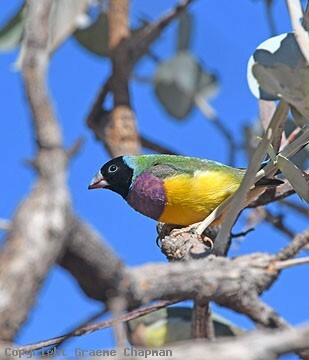 Considerable research has been undertaken on the life history of Gouldian Finches. They feed almost entirely on seeds, either from the ground or ripening seed heads. Their nests are usually placed in a tree hollow and within 3-4 km from free water.The main nesting season is Feb. to Aug. 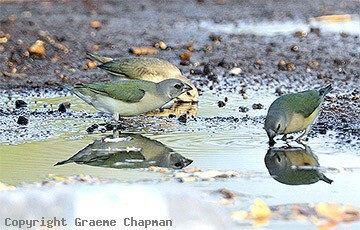 These days they are usually seen in smaller numbers, on average flocks of a dozen or so arrive at waterholes. Occasionally in the non-breeding season they may number up to 50 or 100 which include a fair proportion of juveniles. 670201-D ... Gouldian Finch, a red-faced male. 670202-D ... Gouldian Finch, a black-faced male. 670203-D ... Gouldian Finch, juveniles.